So far, I have been working on the indexing part of Beacon, which is nearly complete. In the coming weeks, I will be running beacond (now index_server) as a service in the background so that I can find and squash whatever bugs remain in the code. For now, index_server is blazing fast, but that might be because the indexes I test against are just a few megabytes in size. From what I hear, though, CLucene can easily handle indexes which are several gigabytes in size without blinking an eye, so speed might not be an issue as the indexes grow. Anyway, any potential performance bottlenecks will only show themselves once people start using index_server regularly. 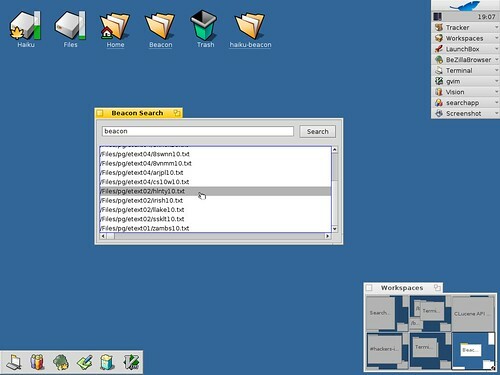 And now for the good part: I have a basic search UI for Beacon up and running. For now, it can only perform simple keyword searches. In the future, I would love to integrate full text search into the Tracker "Find" UI, but for now I'm concentrating on improving this simple search tool. /Files/pg/ is the directory where I'm keeping about 600MB of Project Gutenberg texts for stressing out index_server. PS: Anybody interested in learning the CLucene query syntax can take a look at this page (although, in the future, Beacon will take a BeOS query and convert it into a CLucene query transparently). Most long-standing XHCI (USB 3.0+) issues resolved! © 2001-2018 Haiku, Inc. — Haiku® and the HAIKU logo® are registered trademarks of Haiku, Inc.